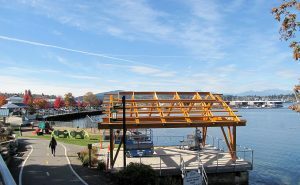 The Port of Bremerton is nearly finished building a covered pavilion overlooking Sinclair Inlet at its Port Orchard Marina Park. The 30-by-34-foot pavilion adds to the amenities of the park, that has a gazebo and grandstands, and it offers another venue for community and private events, such as reunions and weddings. “The overlook is a wonderful area to take in the views of Sinclair Inlet and will enhance the use of the area,” said port Commissioner Larry Stokes. The Port Orchard Soroptimist chapter donated $10,000 to the project, which totaled $35,500, and the pavilion will be named the Soroptimist Overlook in honor of the service club. The group over the years has donated more than $100,000 toward enhancements at the marina park. The city of Port Orchard chipped in $5,500 for the pavilion, which includes the cost of permitting. The port and the city are coordinating on design and construction of a segment of the city’s Bay Street Pedestrian Pathway, yet to be built, that goes through port property. The pavilion is situated along a segment of the path, between the playground and Marlee Apartments, that already has been built. Norm Olson Engineering of Port Orchard provided an in-kind donation of $3,000. The port’s future plans for the structure include adding power, lighting and landscaping, as well as the option to have a fabric enclosure for group rentals. New matting will be installed in the playground, known by locals as “the spinny park,” for its twirling ride-on toys. The port will host a ribbon cutting for the pavilion at 3 p.m. on Oct. 25. It’s beautiful. Big shout out to the Soroptimists and Norm Olson!